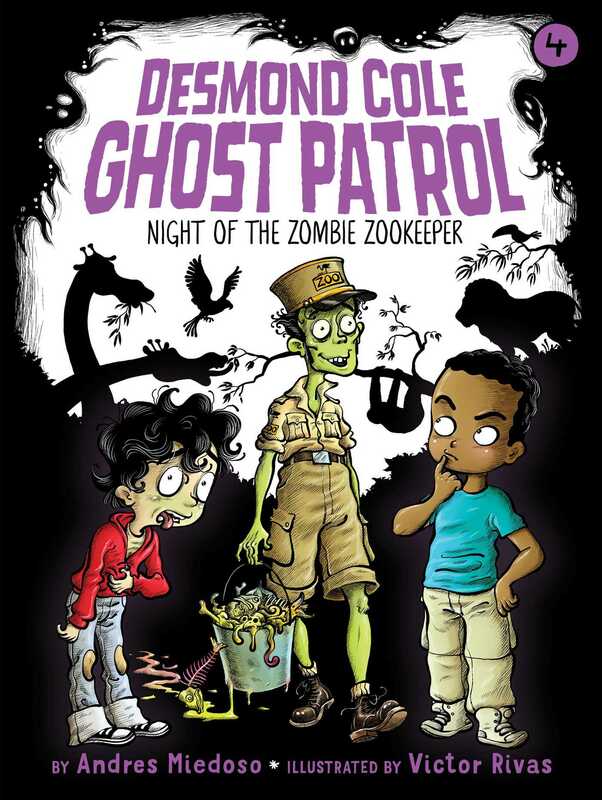 It’s Desmond and Andres versus the Zombie Zookeeper in the fourth book of the Desmond Cole Ghost Patrol chapter book series! Welcome to Kersville, a town with a spooky history and a collection of ghosts and spirits who are major mischief-makers. Most kids spend their days without ever seeing or dealing with a ghost, but some kids get stuck with a haunt. When that happens, they call Desmond Cole Ghost Patrol. There’s no job too spooky, icky, or risky for Desmond. I’m not like that at all. My name’s Andres Miedoso. I’m Desmond’s best friend and ghost patrol partner. For this case, we’re off to the zoo! Zoo field trips are the best. You get to ride in a bus, you get to spend the day outside, and all the animals are safely far away in their enclosures. Nothing scary here, right? Wrong! Leave it to Desmond Cole to find the one zookeeper who’s also a zombie.